How can I make a vessel using the clay bed? 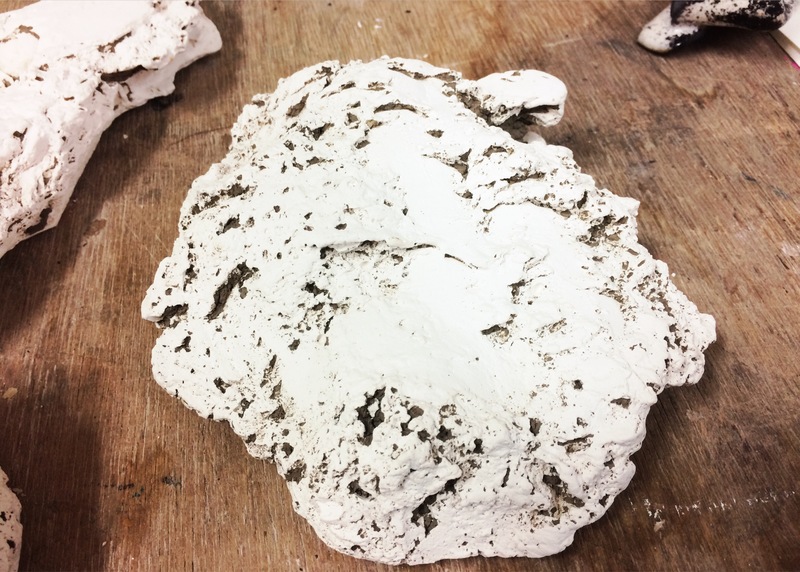 This was the question I asked myself when realising that using local clay was an important factor in my work on contemporary culture in the UK. Having found a site I now needed to find a method to make objects. Taking common garden tools to the site I began to dig a range of small voids in which plaster could be poured and left to set. The plaster void could then be manipulated in the studio. Some voids were too shallow, the clay bed being solid and difficult to dig. All were so full of undercuts that casting would be impossible. To erode the undercuts in the casting process would polish out any sense of the site and the moment of making; so how can I make voids with a genuine site experience? 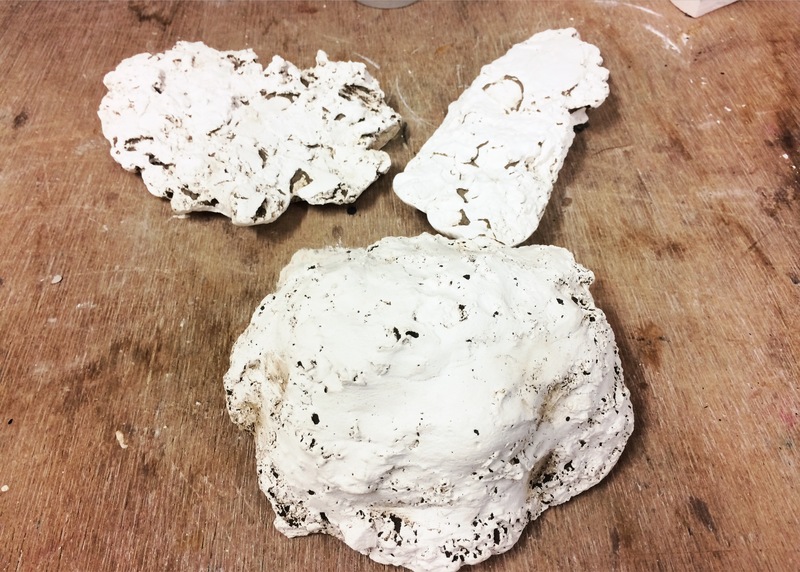 Previously I had removed undercuts by repeatedly forcing a plaster model into clay before casting again. This process gives the model movement and life. However it happened after the original casting and away from the site. To use this process at the site would speak much more of the terrain quality as well as making objects that can be casted. Now, how to create the voids? Using objects from the site appears the most coherent response to this. Objects from the site, speak for the site and of the site. After attending the recent slip casting workshop I wanted to begin understanding the process of producing a mold first hand. My aim: to create a three piece plaster mold of a popular and well-known ceramic mug. Prior knowledge of this technique, though limited, provided a rough foundation on which to build a stronger understanding. I relied heavily on the technician for step by step instructions yet observations provided a ‘direct visual experience’ (Grey, C. and Malins, J. 2004) and modeled good practice. Elements of the process were explicit – clear instruction and process to the making. However, mixing the plaster and understanding when the plaster was ready to pour was initially a tacit experience; having to feel the changes in temperature and consistency. Many mistakes occurred on this first mold making journey, but I have gained a thorough understanding how to prepare the model for casting, how to measure and mix plaster, as well as enabling each mold piece to fit and release easily when required. Slip casting allows the maker (provided there are enough mold pieces) to recreate any shape/form. And I feel on the edge of a huge range of possibility ahead of me. This afternoon’s introduction into slip casting has got me pretty fired up. I’ve used the method before to produce a range of cups and saucers, but as I’m discovering the breadth of its uses is vast. With a visit to the Stoke potteries in a few weeks, this clip from the Emma Bridgewater factory, perfectly captures the slip casting potential.